PORTLAND — That's more like it. 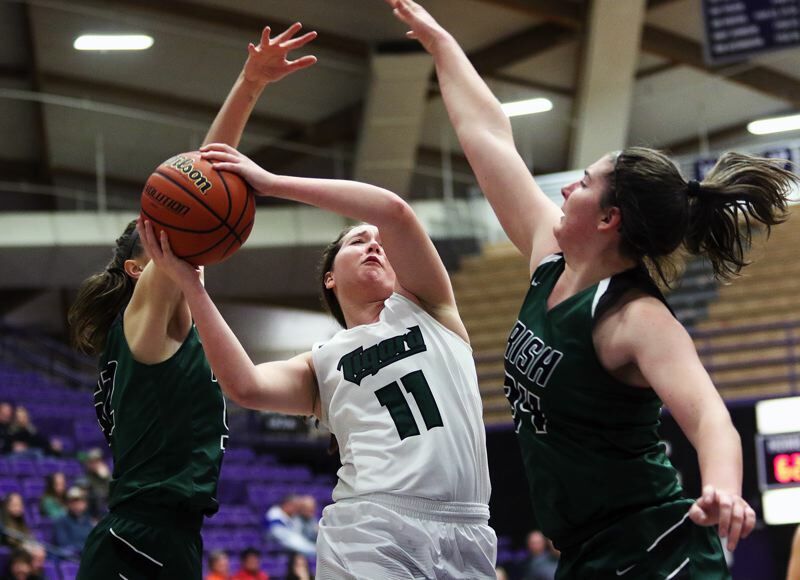 Less than 15 hours after struggling on the offensive end of the court against an athletic, talented Benson squad, the Tigard High School girls basketball team got rolling. 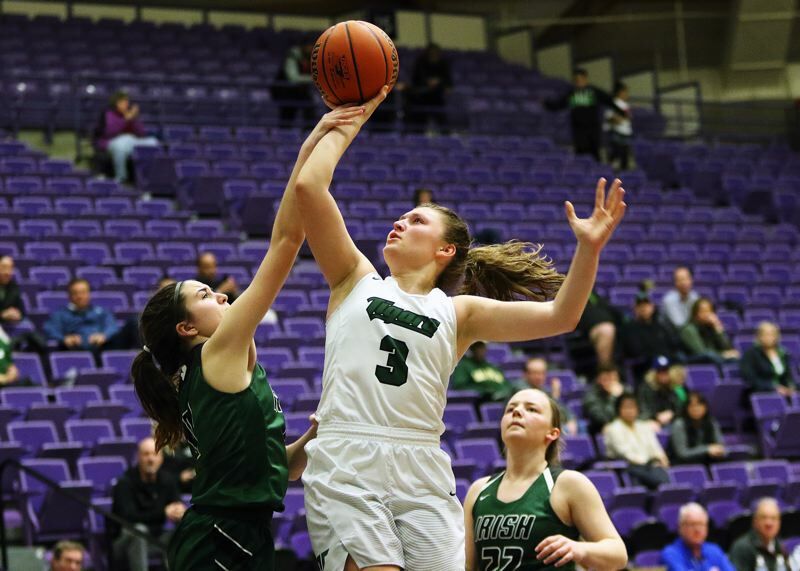 The Tigers, bouncing back in a big way from a 32-28 loss to Benson in a state tournament quarterfinal contest Wednesday night, rolled to a 65-51 win over Sheldon in a Class 6A state tournament consolation semifinal game played Thursday morning at the University of Portland's Chiles Center. "It was pretty important," said Tigard junior guard Campbell Gray, who topped all scorers in Thursday's game with 20 points. "We didn't have the best game yesterday so we had nothing to lose. So we wanted to come out and play hard, play fast." 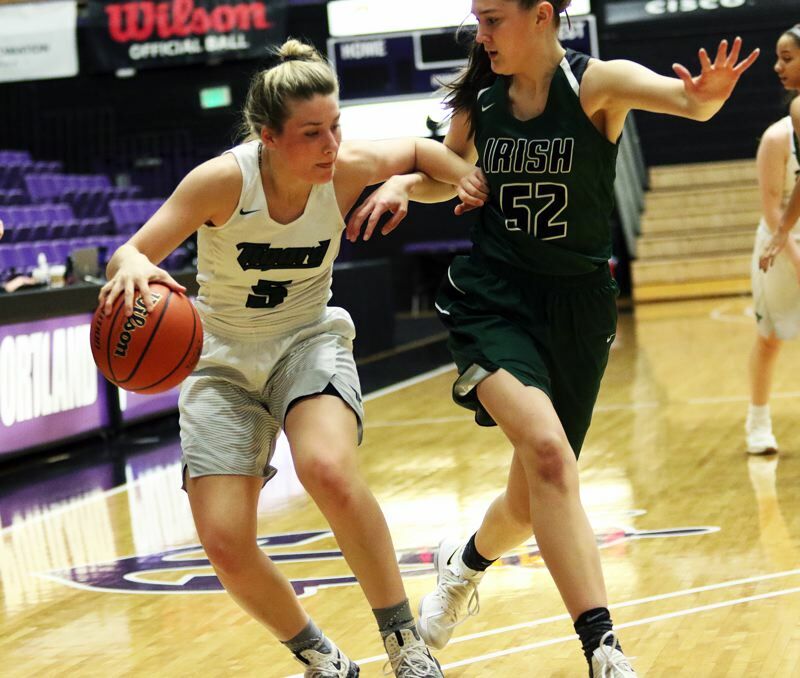 "I think this was really big, considering how we played yesterday," said Tigard junior post Dani Lyons, who scored 13 points in the victory. "We all had to just turn the page and bounce back. That's all we could do." 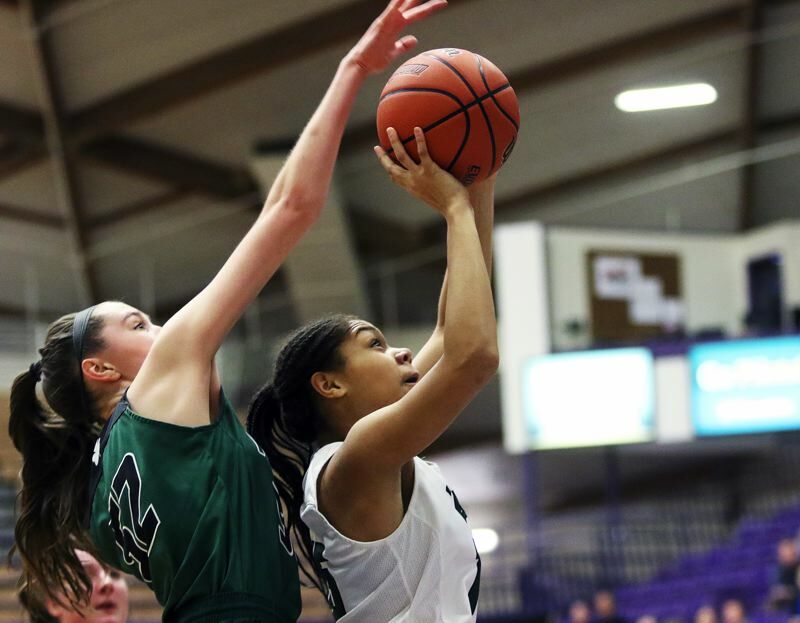 "It was a good bounce back win for us, for sure," Tigard coach Steve Naylor said. "That's a talented Sheldon team. They play nine players, who are all really good." With the loss, Sheldon, the No. 2 team out of the Southwest Conference, and the No. 6 team in the final OSAA power rankings, finished its season with a final overall record of 21-7. Tigard, the Three Rivers League champion, and the No. 2 team in the power rankings, improved to 24-4 on the season. The Tigers also advance to meet Clackamas in the tournament fourth-place game, which will be played Saturday at 9 a.m. at the Chiles Center. "We're going for fourth place now," Gray said. "That will be a fun game." "Our coaches told us the goal, when you come to the Chiles Center, is to play three games," Lyons said. "We got it now. We get to play three games. And nobody likes to lose. We're a decent enough team to run with all the other teams." The Tigers certainly seemed to show that in Thursday's game. They did, however, get off to a bit of a slow start, as Sheldon grabbed an 8-1 lead after junior Emma Newman sank a free throw with 4 minutes and 45 seconds left to play in the first quarter. But, that's when Tigard got going. Sophomore guard Kennedy Brown sank a 3-pointer, off an assist from Gray, and the Tigers took off from there. Lyons scored on a follow-up shot, Gray scored eight points in the final 3:19 of the quarter, and she assisted on a layup by freshman Ajae Kadel, coming with 21 seconds left in the period, giving the Tigers an 18-14 lead going into the second quarter. We started off on our heals a little bit today, but then we decided we needed to attack," Naylor said. "When we did that, we were more successful." 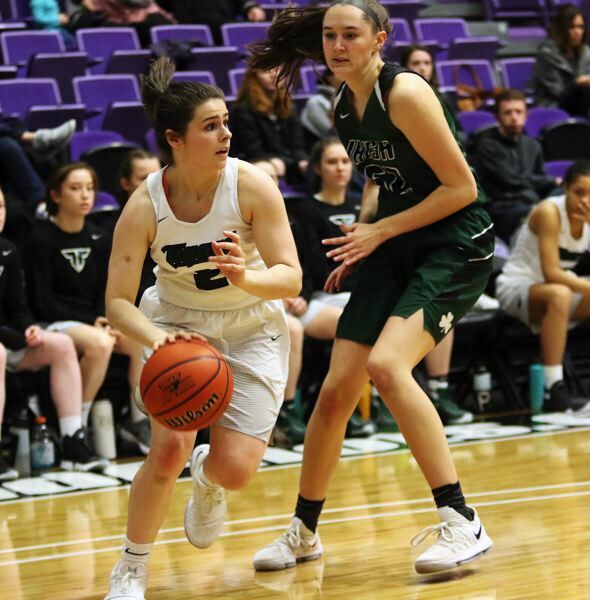 Tigard scored just six points in the second quarter, coming on baskets by Lyons and Kadel, and a pair of free throws by junior guard Paige LaFountain. But, thanks to a strong defensive effort, the Tigers would hold a 24-20 halftime advantage. Tigard then took off, in a big way, in the third quarter. Sophomore guard Delaney Leavitt ignited the fuse, sinking a 3-pointer from the left corner, off a pass from LaFountain, to start the period. Leavitt's second 3-pointer of the quarter gave Tigard a 33-24 lead with 4:20 left in the period. 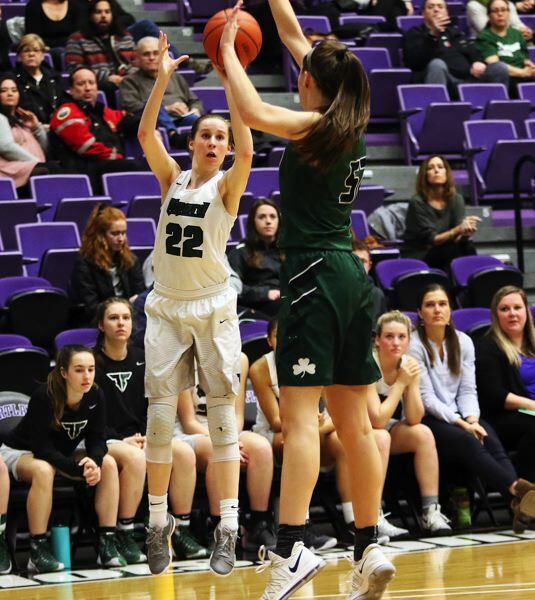 Soon after, Gray would score three points and Lyons stepped out to sink a 3-pointer from the left corner, giving Tigard a 39-29 advantage with 2:07 remaining in the quarter. 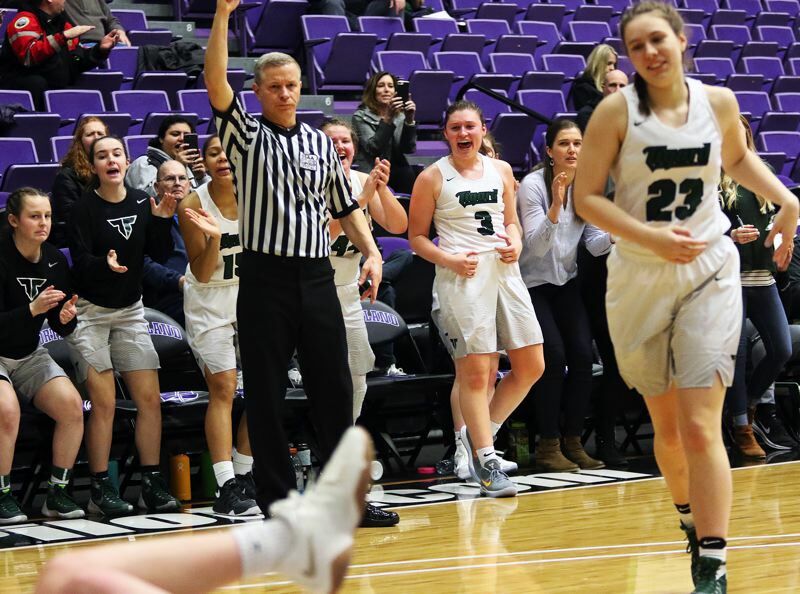 The Tigers would add on baskets on bank shots by Leavitt and Lyons and a buzzer-beating hoop on a 19-foot jumper by senior Gabby McGaughey, coming off a pass from LaFountain, to up their lead to 45-34 at the end of the period. Tigard kept the pedal down in the fourth quarter. A layup by Lyons and another 3-pointer by Leavitt, both coming off assists from Gray, pushed the margin to 54-38 with 5:33 remaining in game. 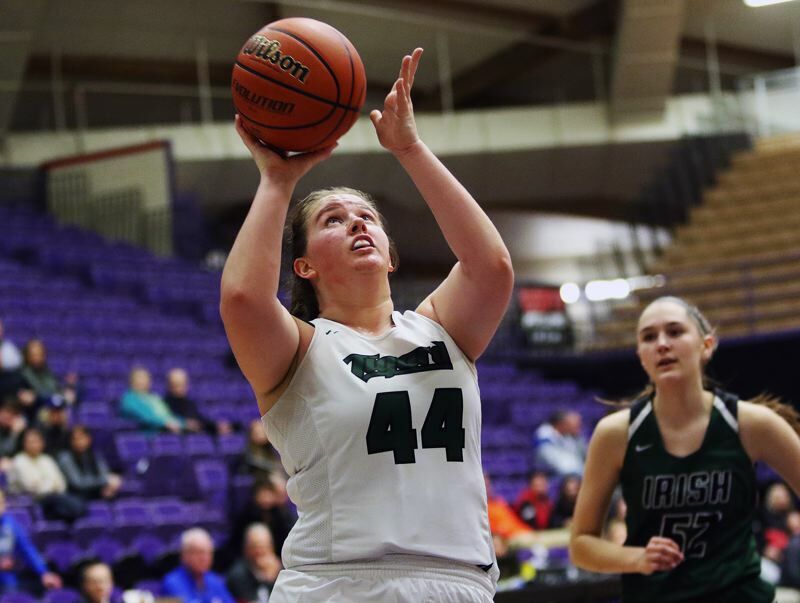 Later in the quarter, LaFountain scored five unanswered points to give Tigard its biggest lead of the contest, at 65-44, with 1:57 remaining to play. Sheldon went on a 7-0 run to finish the game, making the final score 65-51. "It was energy," Lyons said. "When Delaney starts hitting shots I think that picks up our pace. She just hits them one after another. And we were a lot less nervous, and more relaxed. We have one game down, and we knew what it's like now." "Sometimes, when we hit outside shots, our inside game gets going, so we work in reverse," Gray said. "Usually Delaney gets us going with some big shots. And we were being strong with the ball and attacking hard. It was a pretty fun game." Gray, in addition to her game-high 20 points, also had game-high totals of 11 rebounds and six assists. "Campbell had a huge turnaround game," Naylor said. Lyons had nine rebounds, including six on the offensive end, to go with her 13 points. "It is my first time here at the Chiles Center, and I just really wanted it," she said with a smile. Leavitt scored 13 points, all coming in the second half. LaFountain had nine points, five assists, four rebounds and three steals. Brown and Kadel each scored four points, and McGaughey had two. Tigard, as a team, made 23 of 49 shots from the field, with six 3-pointers, and 13 of 22 free-throw attempts. The Tigers also outrebounded Sheldon by a 38-26 margin. "It was important to come back today," Naylor said. "The nice thing is, you don't end your season on a poor note. We got one, and now we have a chance to get another one. Our goal was to play on the last day of the year, and we get to do that." Junior Kami Walk led the Irish with 15 points. Junior Fallon Hanson added 10. Sheldon, as a team, made 19 of 51 shots from the field, with five 3-pointers, and eight of 14 free-throw attempts. Clackamas, which defeated North Medford 43-37 in Thursday's other consolation semifinal game, is 24-4 on the season. Clackamas and Tigard met earlier in the season, with the Cavaliers getting a 55-44 win in a game played Dec. 7 at Clackamas High School.